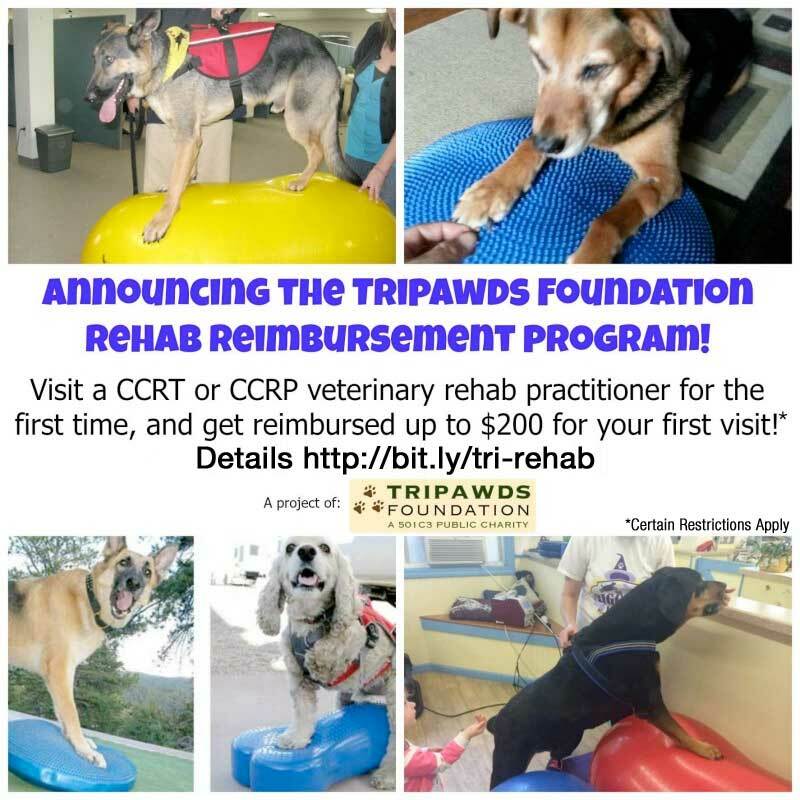 The Tripawds Foundation will reimburse those who meet all the requirements outlined below for visiting a certified rehab practitioner for an initial consultation with their Tripawds. Have you scheduled your appointment yet? Read about Maggie here. The Tripawds Foundation is pleased to announce our first Direct Assistance Program one whole year ahead of schedule! Maintaining fitness and conditioning is critical to keep three-legged animals in top shape, no matter what their age or health condition. If you’ve reviewed the Tripawds Downloads or Tripawds Gear blogs, you know there are many Tripawd fitness exercises you can do at home. Wyatt gets fit on three legs. But there’s nothing like the guidance of a trained, certified animal rehabilitation specialist to ensure you’re on the right track to great health. Even one consultation and evaluation can make a huge difference in your Tripawd’s life. 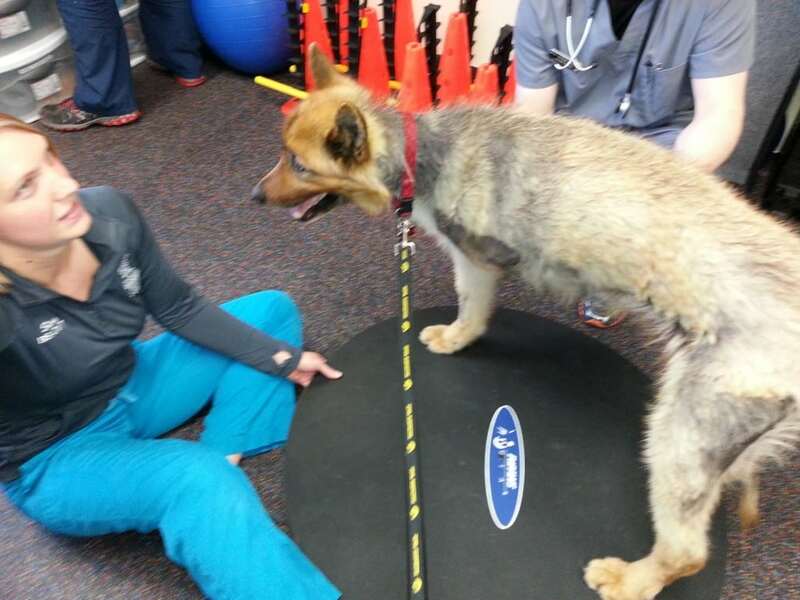 Tripawd Sampson goes to rehab therapy. So starting today, the Tripawds Foundation is granting up to $200 in reimbursement to Tripawds members who visit a certified animal rehabilitation therapist for a first time evaluation. Receive $200 toward your first veterinary rehab consultation! Visit a certified Certified Rehab Practitioner* for an initial evaluation. See below for information about finding one near you. Submit the receipt to us via email within 30 days of the visit, for reimbursement only of the total amount of the first consultation (up to $200). Any cost of medications, supplements, x-rays/scans, conditioning equipment and/or follow-up appointments are not reimbursable. Provide a 300-500 word written report for publication by Tripawds, along with at least two photos. Essay should detail the experience of visiting a certified rehabilitation therapist, and any exercises performed in the clinic or at home. This must be completed within 30 days of their initial consultation. All documentation must be submitted in one email with the subject “Rehab Reimbursement Application”, and must be received within 30 days of first certified rehab visit. What is your Tripawd’s age and breed type. Why is your Tripawd an amputee? Did you adopt your animal as a Tripawd? If so, when and where did you adopt? Describe in detail the exercises you were given by the rehab team and how often you’re supposed to do them? Why were you given those specific exercises? How do they benefit your Tripawd? What one thing did you learn most from this experience? Include a link to rehab clinic website and full name of therapist visited. What is your Tripawds username? How did you hear about Tripawds? 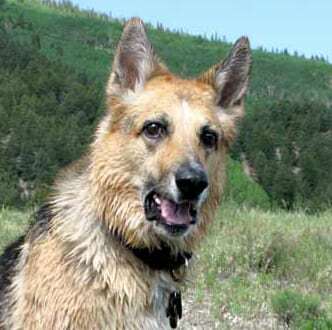 Provide link to Tripawds blog, if applicable. Essay must be submitted as a text document, editable PDF, or email. All of the above must be submitted in one email to Tripawds in order to qualify for reimbursement. Only applicants submitting all documentation will be reimbursed. Receipt must be submitted in the form of a legible unaltered photo, scan or PDF with clinic name and services rendered clearly indicated. Find a therapist near you via the Canine Rehab Institute, or the American Association of Rehabilitation Veterinarians. The Tripawds Foundation will reimburse applicants via Paypal or bank-issued check within 30 days of meeting these conditions. Please provide Paypal account email address or mailing address with your application. *Veterinarians with the designations of CCRT, CCRP, CERP, and VMRT have received certification in veterinary rehabilitation training. Diplomates of the American College of Veterinary Sports Medicine and Rehabilitation also have received board certification in sports medicine and rehabilitation. Tripawds members seeking rehab services for cats are encouraged to apply. Since there is no current certification program for feline rehab, please consult with a qualified practitioner. Many CCRT/CCRP offices also offer services for cats. Approval of qualifying practitioners without rehab certification is at the discretion of the Tripawds Foundation. NOTE: Funds for this program may or may not be available without your support! The purpose of this program is to encourage new Tripawds members to seek professional guidance for developing an exercise and therapy program to keep their amputee pets fit and strong. Only initial consultations and first evaluations with a certified practitioner will be reimbursed. Veterinary services such as wellness exams, acupuncture, chiropractic, laser therapy, hydrotherapy or any other recommended treatments will not be directly reimbursed, nor will any prescribed medications or supplements. Lucy gets rehab therapy by certified techs at CARE. Registered Tripawds username, or email address used to register. Receipt from clinic for first consultation with certified rehab tech(s). 350± word essay about your experience (text document), with 2-5 photos. Submit all documentation within 30 days of rehab appointment. Include Paypal account email address for reimbursement* (if check is preferred, provide U.S. mailing address and allow up to two weeks for delivery). Applicant must be an individual person, not an animal rescue or any other organization. Treatment for animals under foster care or in residence at a shelter are not eligible for reimbursement. NOTE: Grant recipients outside the United States will only be reimbursed via Paypal in U.S. funds. Payment by check is not available for recipients residing outside the United States. *PLEASE NOTE: Subject to availability. Reimbursement to the confirmed pet owner is only applicable toward first consultation/evaluation visit with certified rehab tech. Accessories, supplements, medical expenses and/or other products and services do not apply. Animal must already be an amputee at time of evaluation. Receipt must include consultation date, clinic contact information and itemized session fees. Reimbursement is only available to individual pet owwners who are registered Tripawds Community members. The Tripawds Foundation cannot issue grants to other organizations nor nonprofit entities. Grant recipients who have received reimbursement for any Tripawds Foundation program within the past 90 days are not eligible. This post will be updated accordingly if the program becomes unavailable. 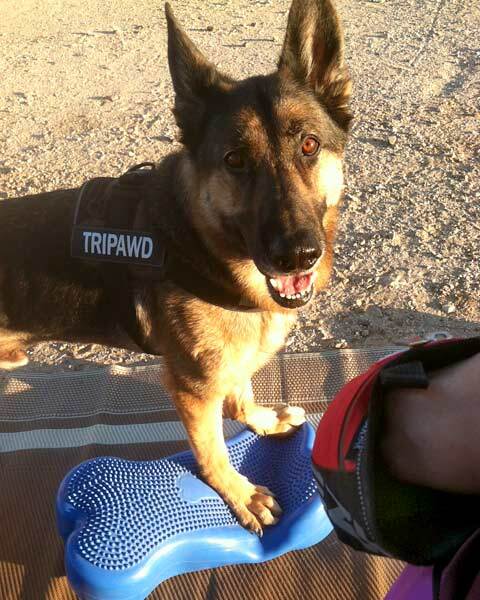 More Free Rehab For Tripawds! In memory of my Bailey Girl. This is so so awesome. I hope people take advantage and go to a rehab vet. I wanted to so bad with Sassy but we never got it done. 🙂 Thank you Jim, Rene, Jerry & Wyatt and everyone who has donated to make this possible for people. Murphy spent several months in rehab following his amputation and subsequent total hip replacement. It made all the difference in his post-amp life. I always recommend it for getting our Tripawds into shape and staying in shape. This is sooo fabulous!!!! What an incredible offering! Brings tears to my eyes…what a wonderful thing to do for new tripawd owners. The power of rehab therapy is very, very powerful & something that we all can do with some guidance and education. Aww thanks everypawdy. It makes our hearts happy knowing this program is so well-received! Can’t wait to see how many stronger-than-ever Tripawds are going to be out there in the world! WOW! Had it not been for the Tripawd Neesletter I would have missed this! Was it a blog I missed? ANYWAY…. this is wonderful! WONDERFUL!! Was it a blog I missed? sorry i missed this. my dog wigglebutt Buddy had his rear leg amputeted on 12/17 and just saw this. You haven’t missed a thing. A number of free sessions are still available! Schedule the appointment soon and follow the instructions above for reimbursement. Great to see this. My tripawd is 12 years old and has been a tripawd for 12 years. Without his regular therapy with our CCRT he definitely wouldn’t still be here with me, let alone sleeping comfortably, while I type this comment! Oh wow Liz, that’s awesome you’ve got him going to therapy. We would love to interview you for the blog, will send you an email. Thanks for sharing, give your pup a smooch from us. Thank you so much I will! Maybe Sugar can get it on this, just 4 weeks post-op for at hip leg amputation for intramuscular HSA, but unfortunately already blew the ACL on her only rear leg left. Have appointment tomorrow with a Certified Veterinary Therapist tomorrow, will mention this. In the meantime, getting measured for Quad wheels, to help her. She is 12 and a Staff, and hasn’t recovered well at all. Was getting around okay, but does not eat, or do much of her old self before surgery. Just heartbreaking. Hopefully they can help you help Sugar. Just submit your receipt, story and photos and you should be good to go! Check the Tripawds blogs, forums and e-books for much more helpful recovery and care information and support from members. You guys are amazing for doing this! I’m going to sign Muji up for an evaluation. Thank you for helping to make this really tough experience a little easier. Aww yay! Please do sign Muji up Karsha, we are happy to help. Is this still available? We’d love to sign up! Awesome program! Our dog recently became an amputee and we are hoping to have enough money for follow up chemo and therapy. Maybe you will still have this program at the end of May when he may get a therapy! Thanks for offering this! Thanks Beth, check back with us then. Best wishes to you and your pup during treatment. Keep us posted in the Forums. Are there any spots left in the program still? Was just looking into rehab for my 12-year-old spaniel Charley, who became a tripawd this month. Will go ahead with the appointment anyway, just curious is there’s any sense in sending in all the info. Thanks! Thanks for asking, and best wishes for Charley! We currently have one more rehab session grant available, on a first-come first-served basis, and will update this post when all sessions have been granted. Yes, a few grants currently remain available to registered memebrs. Thanks for asking! This post will be updated accordingly if the program becomes unavailable. Thank you! I had assumed it was still available but also saw that as of May there was only one spot left. I just wanted to be totally sure before doing the work to put together an application. Thank you for your time in responding to me! Is this going to continue once the 5 grants are met? I saw a month ago someone was working on the 5th application. Our Golden Retriever, Koa, just recently became a tripawd. He had chondrosarcoma in his front leg and is only 5 years old. He had his surgery last week. We’re thinking about taking him in for an evaluation but probably wouldn’t be for another few weeks. No worries, it’s still going on and will be when you take Koa in. Tripawds’ generous donors have enabled us to continue the program. Sorry to hear about Koa, he’s so young! Hope he’s doing well. Hop over to our Forums and ask any questions you’d like, we’re here to help. Is this program still ongoing? My dog is 1 month post op and I would love to get a consultation, but funds are tight. Yes! 🙂 As stated above, this post will be updated if/when the program becomes unavailable. Please review all the requirements and feel free to submit your application. Best wishes and thanks for asking. Our little Lorax could truly benefit from Rehab sessions. He is so young and feisty that I am concerned about his leg strength going into this future. However, of more concern right now are his behavioral issues related to his amputation and abuse that it stemmed from (before he came to his forever home with us). In looking at the websites of registered rehab specialists there is only one in our area, and she is a DMV. She is listed on the pages, and consults with rehab people, but I don’t know if she is a CCRT as well. Would we be eligible for the Maggie Moo fund for an initial consult? Any vet listed in the directories provided will likely qualify. Feel free to email a link to the clinic if you need to know before scheduling your appointment. We’re visiting a certified vet tomorrow for an evaluation. I’m going to submit here in hopes of getting a grant. I live alone plus my fur/feather kids. I have six dogs, one kitty, and a parrot. Everyone is disabled except one dog and the kitty. Any financial help would be so appreciated!! Amputation was costly and I don’t qualify for amputation assistance. Best wishes for your pack! Yes, the Maggie Foo Fund is still available for any Tripawds member who follows the guidelines outlined above. This post will be updated whenever any changes are made to the program.